Now an alternator that provides high output at low RPM! Clean look, direct bolt-on. We use a Delco CS130D case and beef it up to provide your choice of either 140, 160, or 180 amp max and up to 120 amps at idle! This is enough output to power electric cooling fans, compressors, halogen lights, and most stereo systems. Our high output alternator has the same mounting pattern as the straight ear alternators found on GM vehicles from 1964 through 1996. It is also only 5" deep from the front edge of the mounting ear to the back of the output stud. 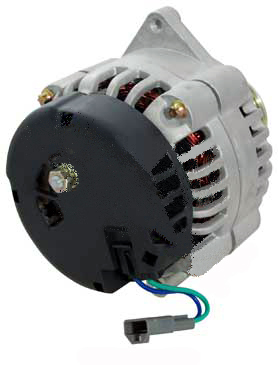 This is a true 1-wire alternator and will turn its self on without having to raise the engine RPM initially. This makes it perfect for hot rods, custom vehicles, and is very durable for off-road use. Also available as a plug-in version for use on vehicles with a charging system dash light (harness included). Need more amperage than this alternator can provide? 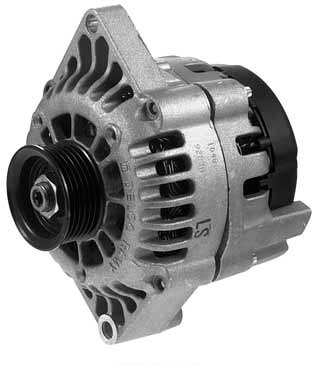 CLICK HERE to see our Mega Amp alternator that is a direct replacement for this unit.